Tennesee Judge Order: Public Advocate V P Mark Clayton Protects Minorities In Memphis Against Liberals' Bigotry | Public Advocate of the U.S.
Public Advocate's vice president Mark Clayton assisted a minority candidate for Congress to obtain ballot status by providing critical research based on his own experience and pleadings in his own case. The candidate in a Democratic Party race has been restored to the August primary ballot. 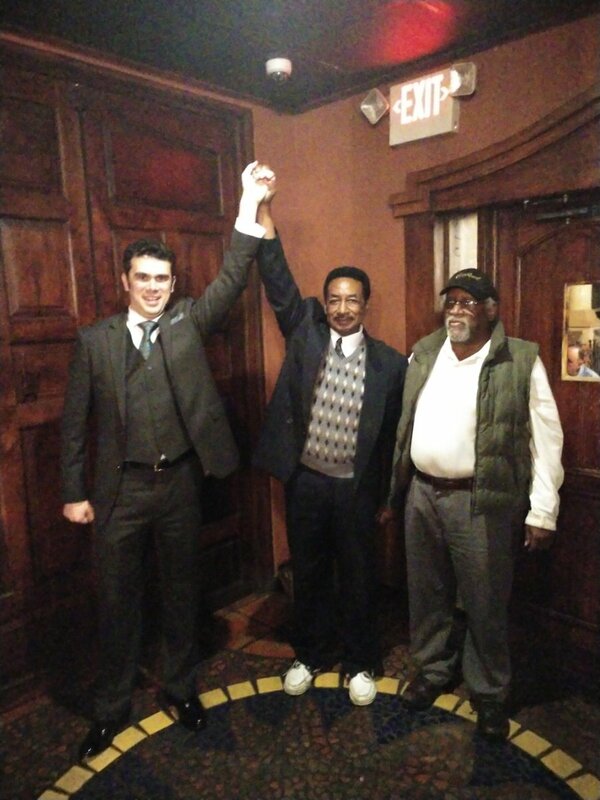 Candidate celebrates Court Victory with Mark Clayton. Mr. Latroy Alexandria-Williams praised Mark Clayton's call for a Tennessee Code Annotated Title 2 Criminal Investigation into Tennessee election officials. "GREAT BRIEF, MARK KEEP UP THE GOOD WORK , THANKS LATROY." UPDATE UPDATE Public Advocate VP Mark Clayton, and former Senate candidate, reacts to announcment that Election Board may respond favorably to the Judge's court order with a demand that the local district attorney investigate and prosecute election corruption. The election commission is now saying that they do not have to obey the court ORDER to place M. Latroy Alexandria-Williams on the ballot. The election crimes occurred in Davidson County Tennessee, and the election coordinator, Mark Going, Mary Mancini (TNDP Chair) and all accessory parties should be immediately investigated, charged, and indicted under Title 2 in my layperson's opinion. Earlier, I informed your office that this is institutional criminal violation of Title 2. M. Latroy Alexandria-Williams is but one of some forty (40) to sixty (60) people whom Mark Goins alledgedly conspired against in secret, ex parte meetings to remove from primary ballot in (possible) criminal violation of Tennessee Code Annotated Title 2. So far, your office of district attorney seemps to be on the wrong side of history in sitting on its hands, seemingly to be knowingly watching election crimes occuring in broad daylight just blocks down the street from your own office in our state's capitol, Nashville, Tennessee. On behalf of Tenneseans, We call for the immediate investigation and prosecution of election crimes as committed by Election Coordinator Mark Goins and accessory officials. Until either your office or the office of the United States Attorney enforces the criminal election code in Tennessee, Tennesseans (may have cause) to owe neither fealty nor honor to state public officials of any branch of government, as at this point (it would seem) all Tennesseans are ruled by criminal mob actions outside of our state election laws and therefore WITHOUT CONSENT OF THE GOVERNED. Currently by comparison Mexico seems to have freer and fairer elections than Tennessee, because in Mexico candidates are allowed to run for office as long as they are not assassinated. In Tennessee, it is abundantly clear now based on my repeated filed complaints and pleadings and in this case involving Latroy Alexandria-Williams, our front-runners and community leaders are not allowed to run at all. Right now your office is securing for itself an embarrassing place on the wrong side of history no less severe than Jim Crow. If your office chooses inaction, then your office will go down in history as those who oppossed Frederick Douglas, Dred Scott, Rosa Parks, and Martin Luther King, Jr.